In 1-quart saucepan, mix all chutney ingredients. Heat to boiling. Reduce heat to medium-low; cook 12 to 15 minutes, stirring frequently, until onion is tender and sauce is slightly thickened. Meanwhile, heat closed contact grill for 5 minutes. When grill is heated, place salmon steaks on bottom grill surface. Close grill; cook 6 to 8 minutes or until salmon flakes easily with fork. 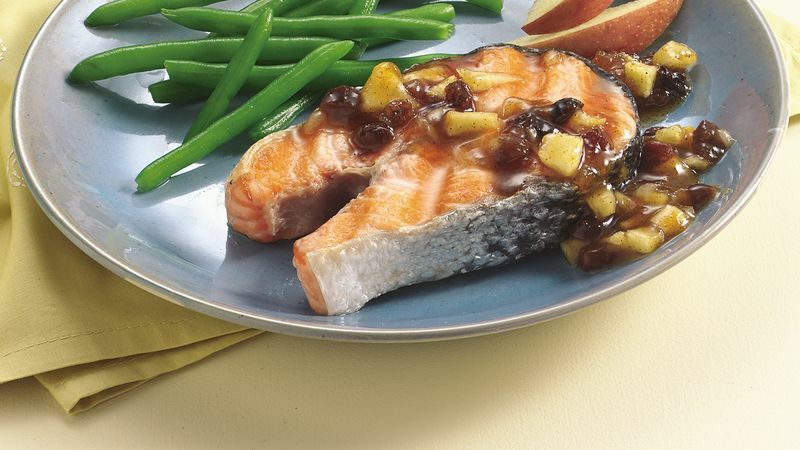 Serve salmon with chutney. Fish such as salmon and tuna contain omega 3 fatty acids, which the American Heart Association recommends as part of a heart healthy diet. Aim for 2 to 3 servings of fish a week.